15th NTRCA, preliminary Test will be held on Friday 19 April 2019 and Written Test will be held on 26 & 27 July 2019. 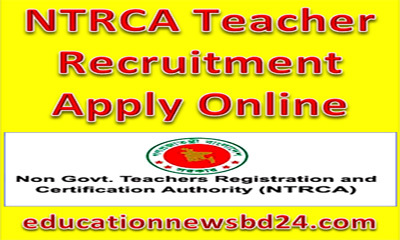 NTRCA 15th Teacher Registration Circular 2018 has published. Online Application Starting Date 05 December 2018 and Ending date 26 December 2018. COMBINED NATIONAL MERIT LIST FOR 1-14 AND 2010 SPECIAL EXAMS. E Requisition for Teacher Appointment. Selected Candidates List (NTRCA Public Circular On 2018-08-26). Combined National Merit List 1st to 14th NTRCA published on 2018. 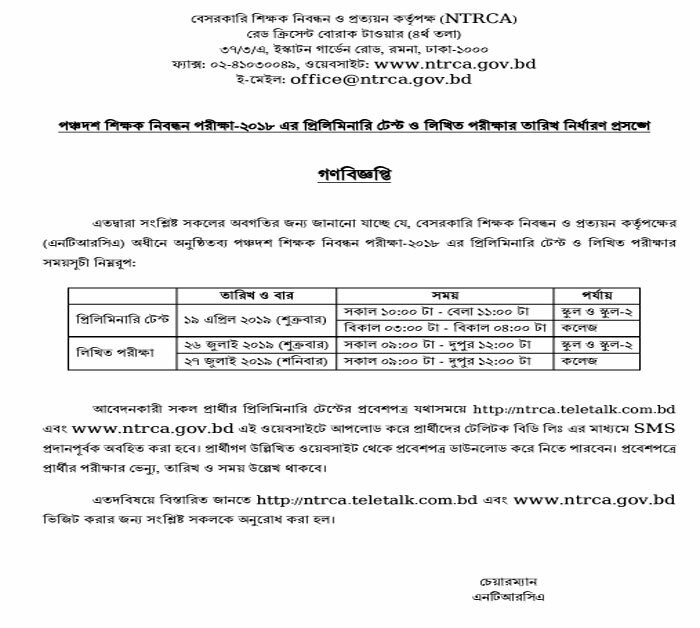 NTRCA National Merit List (1st to 5th NTRCA) Necessary Information Fill in deadline 30 June instead of 26 June 2018. Non-Government Teacher Registration & Certificate Authority (NTRCA) has been issued 15th teacher registration circular. According to the circular Preliminary Test of School & School-2 will be held on Friday 19 April 2019 10:00 A.M. to 11:00 A.M and Preliminary Test of College will be held on Friday 19 April 2019 03:00 P.M to 04:00 P.M. Written Test of School & School-2 will be held on Friday 26 July 2019 09:00 A.M to 12:00 P.M. and Written Test of College will be held on Saturday 27 July 2019 09:00 A.M to 12:00 P.M.
NTRCA 15th Teacher Registration Circular 2018 has published & found here. 15th Non-Government Teacher Registration Online Application Starting Date 05 December 2018 and Ending date 26 December 2018. To mentioned that 14th Non-Government Teacher Registration Online Application Starting Date was 06 June 2017 3:00 P.M. 14th Non-Government Teacher Registration Online Application Ending Date was 10 July 2017 up to 6:00 P.M.
and Written Test of College will be held on Saturday 27 July 2019 09:00 A.M to 12:00 P.M.